This post is by Pilar Newman, an eight year Amazon seller veteran who runs her business full-time while traveling the world. She started her business on a few hundred dollars to later becoming a multi six-figure seller. In addition to working on her first Amazon FBA training course, she writes for her Amazon seller blog at pilarnewman.com. Learning how to capitalize on fast-moving industry trends can significantly bump sales for any ecommerce seller. It’s an opportunity that sellers such as myself seek out like a hawk in order to quickly turn around products at some of the highest profit margins. This is especially true when one uses private labeling as a method to enter the marketplace at a competitive cost, and ride the wave of a hot new trending item. One of the easiest and fastest ways to profit from a trending item is to produce a secondary product relevant to the main item. This is often seen when the latest tech gadget is released, and a rash of new compatible accessory items erupt onto the marketplace. But competition is very high when it comes to profiting from trending products, and you can’t just jump on the bandwagon and expect to be successful. In this article I’ll tell you how I’ve made money from trends in the past, how you can identify hot products yourself, and my best tricks and tips for creating your own complementary items. In 2013, the opportunity to capitalize on a trending item in the children’s crafting niche became one of my most profitable ventures to date. 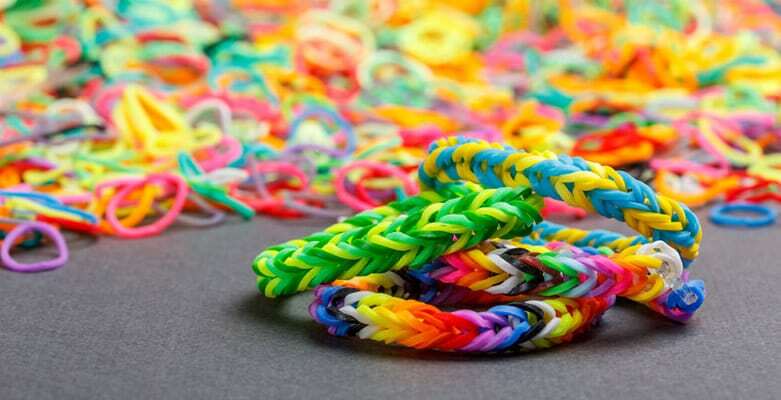 An inventor by the name of Cheong Choon Ng created the hugely popular Rainbow Loom kit in 2011, and in 2013 it really took off, becoming one of the most popular toys in the world. The Rainbow Loom is a fun plastic looming device geared to children, for crafting small rubber bands into bracelets and charms. As a full-time Amazon FBA seller, I’ve seen how trending products can quickly take off on the ecommerce juggernaut’s platform. In early 2013, the short window of opportunity was plainly in view. I acted fast in order to get to market as quickly as possible. My first order of business was to contact suppliers on AliExpress to find generic rubber elastic bands that I could private label and test on the market. AliExpress lets you order in small quantity batches from vendors in China. I air-freighted the items in and picked two winning vendors based on quality of the product, the vendor’s communication with me, and their ability to have a fast turn-around time. These were all key factors in my early success with this product. Soon after, I began to differentiate myself by packaging many of the kid-favorite colors together into larger packages. I began offering these packages on Amazon at a much lower overall cost to the consumer, than if they were to buy each color individually. This move helped me gain greater traction on the Amazon platform and my visibility skyrocketed. I knew it would be a short time before my competitors started to roll in, so I decided to expand further by offering more complimentary items to the loom kit. This increased my line-up of products to include charms, specialized kid-friendly looming needles, loom storage boxes, as well as other kid looming products. As Christmas time neared, I heavily stocked my best selling loom items and hit some of my best numbers to date. By creating complementary items for this crafting kit, I was able to hit a sales revenue of $500k in 3 months using Amazon FBA. Profit margins on those three months alone beat out my combined profits for the other 9 months of the 2013 calendar year. I no longer sell complementary items for the Rainbow Loom. That window of opportunity has come and gone, but I’ve since seen many new vendors come in with their own private label version. Some have gone so far as to blatantly hijack former popular loom listings and make it their own, because of their favorable ranking. It’s all part of the cycle of selling a highly visibly product. When profit margins start to thin out, that’s a good time to start making your exit before it becomes a race to the bottom for the lowest selling price. But since 2013, I’ve taken advantage of three other prominent trending ecommerce items. I’m getting better at finding them and acting quickly before the masses start to come in. I’ve successfully done this in the same manner as the Rainbow Loom back in 2013, but with one major difference: I now travel the world while my vendors package, label and send my items direct to Amazon’s warehouse on my behalf. This amount of freedom that I’ve built into my Amazon business has been my most valuable asset thus far. It has given me time back to spend with my family, travel the world, and work on other projects outside of Amazon. Much of this achievement has taken a lot of patience in working with my most trusted overseas vendors. After a few years of building this trust, and with multiple visits to China, I now have a great team of ecommerce agents who are helping me steadily grow my business and take it to the next level. This fine-tuning in the operations of my business is what allows me the freedom to work from anywhere, while I focus on the high level overview of my business. Seven years after my first sale on Amazon and from an initial $900 investment, I’m now a multi-six figure Amazon earner with the freedom of time. Trends in their core nature are fleeting in popularity and require precision timing for best results. Not all trend-seekers will find quick fortunes in hunting down these items. There are various challenges that come along with selling something extremely popular and highly visible. For one, a seller must be prepared to compete with other sellers looking to take their portion of the market share. Oftentimes, the war between sellers can get downright ugly as they compete for the buyer’s attention. There is a great deal of profit to be made in a rather short period of time. Buyers are willing to pay top dollar for a popular item. You’ve already found an established winner within the marketplace. Creating a complementary product to a popular item has a greater chance of success than if starting from scratch with an unknown product line. Smaller sellers can rapidly turn low investment capital into something much greater. This way, they can accelerate the growth of their main business. Timing is everything. If you come in too late, there is a strong chance the marketplace will have already become saturated, leaving your product with a grim chance of survival. As more and more sellers enter the marketplace, there will be an inevitable race to the bottom in terms of product pricing. Larger volume sellers will be better able to compete, while smaller sellers will eventually be drowned out. Trending items are temporary market items. They are not great for building long-lasting businesses. Some sellers will play dirty and enlist buyers to leave bad product reviews on your items, or use other underhand techniques to damage your chances. Selling trending products is not right for everyone. Sellers who are fast action takers and creative thinkers are the best suited to selling fast moving trending items. They should also be highly perceptive, and keen to find opportunities that others may not easily see at first. It’s all about entering the marketplace first and winning market share, and a little foresight can help sellers win a lead in the race. Examples of the latest trends can be found all around us. It can be your neighbor’s daughter who is sporting the coolest band around her wrist, which later becomes known as Silly Bandz. Or it can look and come in the form of funny looking shoes, such as the well-known Crocs shoes. Ever seen Crocs shoe charms for children? It’s a great secondary product for the Crocs. Just make sure you look beyond the most popular items such as the latest Apple iPhone. Look for lesser known name brands, that are quietly shaking up the marketplace with new innovations and products. There is a limited time frame when a fad or trendy item is worth pursuing. Many retailers employ large companies to help fish out these opportunities. There are also specialized services offered by such companies as 360pi and Springwise that help give insight into new trends around the world. You can sign up for their free newsletters, but to get more advantageous trend reporting it can be costly for smaller sellers. Personally, I prefer sticking to my own non-traditional ways of trend watching, which mainly consist of paying attention more to things occurring around me. I travel often and this also helps me make connections with what’s happening in different parts of the world. 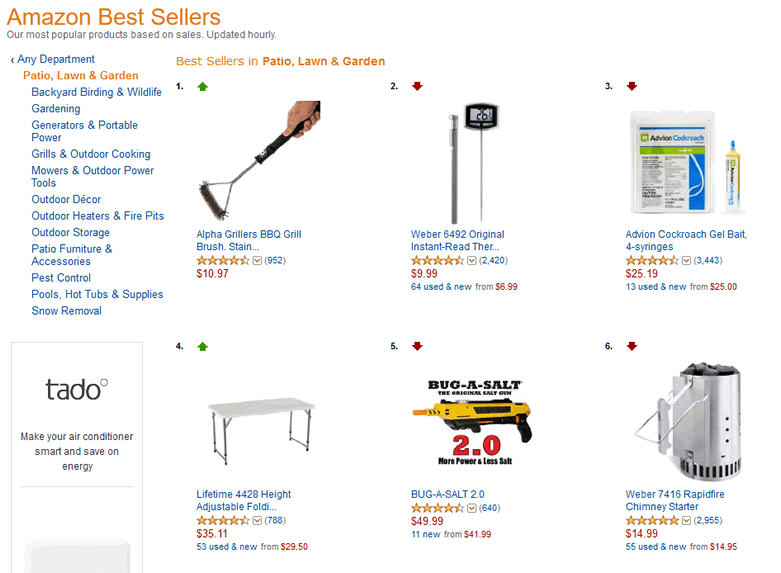 Amazon have also provided a gateway for sellers large and small to focus on hot new products, by way of their top 100 best sellers list in each main category. Originally I started with the Amazon top 100, and that was one of the first times I noticed the Rainbow Loom. Later on I noticed that my friends’ kids’ were wearing the bracelets, and I started inquiring about it a little bit more. I do a lot of product tracking. For example, over the last three years during the Halloween sales period, I have tracked some of the top selling items in various main categories and sub-categories, such as home and kitchen and party supplies. I’ll start tracking about October 1st, and in an Excel spreadsheet I put the name of the item, the main category it’s listed in, the best seller ranking, current pricing and FBA pricing. I track the products every few days up to Halloween, so I can start noticing a trend. If a product is doing really well, then the following year I have a better idea of what to sell and how much quantity to buy. This takes time of course, but over three years I have built really good reports for myself of what I should be selling and what may sell very well. I prefer my own monitoring over commercial tracking tools. A lot of these tools are inaccurate, and it’s often difficult to differentiate the good ones from the bad ones. Additionally, similar to how Amazon tracks sellers’ items for their own product research purposes, I suspect that some of these software tool creators are doing the same. You should also find your industry newsletters and subscribe to them. If you’re in the kitchen and home category, then look for the kitchen and home industry magazines and trade newsletters and sign up to them. Subscribe to your industry YouTube channels and find out who the top influencers are in there. Social platforms such as Facebook, YouTube and Pinterest provide a lot of triggers for the latest trending products. YouTube stars are often the first to catch on to the latest item out there. Many times these stars are paid to promote items, because there is a high potential for a product to gain popularity with the heightened visibility. These are products that will either begin to build sales over the course of the next few months, or will fall flat and never gain good traction. Either way, it’s wise to take note of these products and keep a pulse on how well they are starting to perform. One hugely popular toy review channel is EvanTubeHD. For me, having done this for some years, my agents in China have become my product informants. They tell me what’s going on over there, what’s getting hot in the market, and what people are ordering. If my agent in China is telling me, “Hey, this is really moving, there’s a lot of companies buying in large quantities,” then I’ll look a little deeper. Building a relationship with your vendors is really, really good for a long term business model because you start getting those little tidbits of information. After you’ve done this for a while you get a better eye for finding trending items. Talk with people. Keep an open mind, pay attention and notice things a little bit more. That has been a big part of the way I come up with good items, because a lot of people don’t talk or pay attention to what’s going on around them. It’s also great if you can start to do some general traveling outside of your regular zone. You start noticing what’s going on in other countries, what’s trending, that maybe you could take back and sell on your home market. Also read a lot about what you’re interested in. Just having more life experiences, expanding your mind and learning new things, is really going to help with your Amazon business. Start with what you know, increase your knowledge, and keep going ahead. An example I work through with my course students is Mason jar wedding decorations. Coming from New York, everyone uses Mason jars for soap dispensers, cups, all sorts of fun nifty stuff. I’ve come to Massachusetts now, and I don’t see as many Mason jars. That makes me curious, so I take it onto Amazon, and notice that someone’s selling a Mason jar soap dispenser for about $16. All they did was add a dispenser top and private label it. Then in the main wedding season, I look into what are people doing for their weddings and if there’s anything trending, and find on Pinterest a bunch of different ideas for how you can use a Mason jar to make wedding decorations. So it’s an intuitive process, noticing something (or the lack of it) in a few different situations, that can lead to a whole new profitable product. I didn’t pursue that particular angle, so I’m comfortable with sharing it! Once you have found a trending product that you think has potential, head back to Amazon and look for any accessories or complementary items already on sale. Amazon makes this easy with it’s “Frequently Bought Together” and “Customers Who Bought This Item Also Bought” features. If the market isn’t already saturated, that’s a go-ahead to come up with your own complementary product. But steer clear if there’s already a lot of products already being suggested. For example, there is a water balloon toy called Bunch o’ Balloons that has some sales traction this year. Instead of selling the trademarked apparatus, people have started selling refill balloons, and there’s a bunch of people who have that same complementary item. So this would be a really bad time to get into it, because there’s too many people already on there. The people who got there first are the ones trending really well on Amazon. Pinterest is currently my go-to platform for coming up with ideas. If there’s something already trending on Amazon, search for it on Pinterest. Sometimes you’ll pop up with DIYs or tutorials, or you’ll just start noticing what people are doing with that particular item. That’s a good way to start generating ideas. YouTube is also great for generating ideas. Some of my best market research for finding complementary items to the Rainbow Loom came from watching DIY tutorials of children using the loom kits. You’ll often see people doing creative things with popular products on YouTube. One of the things I noticed on YouTube is that a lot of kids had so many rubber bands they didn’t have anywhere to place them. Then in one video someone said, “Look, I bought this little thing at the Michaels for my rubber bands to go into.” It was just a plastic bin with little compartments, but put a sticker on and call it a “loom bin” and that’s all you need to create a new product. Agents have a pulse on what’s going on in all sorts of sectors. Over time they have become my trend informants. On Pinterest back in 2013 people were coming up with little DIY Christmas ornaments to make with the Rainbow Loom. From that you could put together a pack of rubber bands in Christmas colors complete a pamphlet on how to make the ornaments. There was also Breast Cancer Awareness Month when people created white and pink rubber band packages for people to make fundraiser bands. With the Rainbow Loom, as I don’t have any young kids around me, I was also hanging out with some of my friends and showing them the kit. Then they would tell me their kids were using them at school as fundraisers, making bands to sell for charity. It’s good to just talk it around with people that might know more about it, and get ideas from them. And as before, working with a knowledgeable agent is invaluable. I have a few vendors in China that I have used many times, but there’s one particular agent that I’ve stuck with over the last few years. We customize certain items now, so if we see things in the marketplace that could sell we talk about opening up a new mold. That might cost me $600 or $1,200 depending on the mold and the different designs or colors. Then he’ll find the manufacturing company and take care of it for me. Agents have a pulse on what’s going on in all sorts of sectors. They’re not tied into just one manufacturing company or one industry. Over time they have become my trend informants and helped me learn the process of private labeling. Yes, they take a cut of the money, but now I have a really good business partner in China who’s keeping me abreast of what’s going on, and it takes time to build that. Timing is everything with trending products, so it’s crucial to act quickly. If a product takes off, then it becomes crucial to keep up with the volume of orders. I talk a lot on my courses about finding agents on AliExpress. People always say, “Why AliExpress? You’re not getting the best price. You should go to Alibaba.” But if you’re just starting off with a new product, you don’t want to buy a large quantity because you don’t know if it’s going to sell. You also need to get hold of that product as quickly as possible, which is another strength of AliExpress. I found all of my vendors through AliExpress originally, and went on to meet them in China later. Finding a manufacturer and placing an order quickly is the first step, but you also need to arrange fast shipping. With the Rainbow Loom products, I air freighted very heavy rubber bands. Most people would not do that because it’s extremely heavy, but it didn’t matter because it meant I was one of the first people to hit the marketplace. Even with an item that cost a little bit more than I like to pay, I was making a great profit margin. Later on when you’ve got the right quality item with the right packaging and so on, you can switch to sea freight but the most important thing is to make those first sales. The demand for trending items can often be overwhelming for sellers who fulfill orders themselves. Another tip for acting quickly is that you don’t always have to use overseas vendors. There are a lot of manufacturing companies in the United States that you can find through websites like Maker’s Row, out of Brooklyn, New York. They’re quite new and don’t have as many manufacturers as the better known ThomasNet. This year I’m working on a Halloween item with a US manufacturing company and they’re not much more expensive than China, and their item is a little bit more quality. You can come to market faster if you use a US manufacturer, but you’ve got to remember the price point. It’s going to be inflated if you’re working on a trend that’s really popular, but you can do that to get to market first then find another supplier to get better pricing. Finding a profitable trending item helps secure your success in the marketplace, but it also involves being able to keep up with demand. The demand for trending items can often be overwhelming for sellers who fulfill orders themselves. I use Fulfillment by Amazon (FBA) to take this limitation off my shoulders. The FBA program allows sellers to use Amazon’s own warehouses and supply chain process to handle your orders. They also handle customer service and returns, leaving you more time to work on other aspects of their business such as finding more products to sell. Products need preparing and labeling correctly for FBA, which can also be a bottleneck if you do it yourself. I do recommend that brand new sellers handle their products themselves so they can check the quality, but later you can use an agent or service provider to manage the process of sending products into FBA. Your own supplier or agent might be able to prepare products for FBA, or there are specialist services who will do pre-shipment quality control then package and sticker your items. Examples include Ejet in China, FBA Inspection in the US and many more. (I have not used these companies, they’re just examples of businesses who provide these services). Finding a trend, creating a complementary product, and getting it to market quickly will take all your energy, persistence and creativity. But it’s not everything you have to do to make a lot of profitable sales on Amazon. I find that the most important thing to do once your product is up on Amazon, is to work on the specific keywords on the product detail page. Amazon is a keyword based search-driven platform, and these are the keywords that your product is actually going to appear for in the search results. But I see people immediately going to Amazon Sponsored Products ads, putting in a list of 500 keywords that they found using Google Keyword Planner, and throwing a bunch of money at it. They might get one or two sales then they turn it off and wonder why they don’t get any more. A lot of people neglect to take the keywords that have been working with the sponsored ads and put them back into their product detail page. You do need one or two product reviews to get sales going. There’s a lot of talk about the changes to the terms of service at Amazon, and they’re now dinging people who are offering deep-discount coupon codes in order to manipulate their ranking. But you do need to have one to three people lined up who can buy your product at full price so that you can get some verified reviews, and people see that this is a decent item. But I am a proponent for starting Amazon pay-per-click ads immediately, even before you get reviews. For trending items you have a better chance of getting sales because it’s already popular. Then keep playing around with the keywords, because the ads will start showing you which keywords are working better. Whenever there’s a new order, I will immediately contact the customer and let them know I would appreciate their feedback, or you can use a feedback service for that. Then finally you just have to let it go. Trending products already have a built in audience, so it’s a little bit easier to get velocity on those items. That’s really the point! I include trending products in my ecommerce portfolio because I can generally flip my investment capital much faster. This then allows me to further accelerate and grow some of my niche product lines that I sell throughout the rest of the year. When you hit a trending item at the right time, the results can be amazing! What an incredible story and amazing success you have had with Amazon FBA. What would you recommend as the best way to launch a product that is on the 5th page? Social launch with a funnel and a discounted price of e.g $1? Thank you for your comments. Social launches are always a great strategy, but the days of excessively using the $1 and $2 deeply discounted coupons codes for ranking or to gain product reviews are coming to a near end. Amazon has already pointed out with their new TOS changes that this form of manipulating their system is being monitored and sellers will be penalized. The plate is hot on the burner and you don’t want to push out a sales funnel such as this and cause a red flag within Amazon’s algorithm. If you are carrying a niche line of items, then creating a visible coupon code on the product detail page for a cross sale item is a good start. Coupons are meant to be deals to further incentivize potential buyers to buy now instead of later. You may want to offer something such as a 40% discount for this kind of coupon offering pointing to your new cross-sale item. Additionally, it is becoming more important to create Facebook niche fan pages for your products and to actively engage with these fans. From there, you can use lead generation tools or Facebook contests to capture their email address and offer them an Amazon coupon code for a reasonable, yet high enough discount to warrant a sale. $1 and $2 coupon code users are normally bargain hunters simply looking for a deal and will rarely buy your product at full price. When you actively go after your target audience and market to an interested audience, then there is no need to give away your product for free anymore. You will find more genuine customers for your Amazon products, and better yet, you will be building a list of repeat customers. Consider these more long-term strategies for building your business both on and off of Amazon. Pinterest promoted pins marketing is another avenue to look into for launching a new product. Very informative article with great information for FBA sellers. Glad you enjoyed the article Adrienne! This article gave me a ton of new ideas. I see that I’ve some more detective work to do and heading over to Google Alerts as we speak…thanks! Are you allowed to ask for feedback from Amazon customers? Can you put a note requesting it in the package if you sell MF or email to follow up? You can find more information about this under Amazon Seller Help –> Reviews and Feedback. Wow, this article is great! Detailed and informative – such a great resource for Amazon sellers! Really excited for your course launch coming up. I can’t wait to follow along as you grow to continued success. Thank you greatly for your support Tiana! I’m working with my great group of Amazon FBA course pilot students now. By end of year, I should have something available for those on the waiting list for the final version of the course. Make sure you are signed up to my newsletter on my website to receive further information when it is ready to launch! A very motivating article and fantastic FBA results! Love the article! Wonder how well this would work for dental products? Great article. Will you be having any meetups in the tri-state area where people can discuss Amazon FBA and related subjects. At the moment, I’m traveling overseas and have no immediate plans for a meet-up in the tri-state area. If anything changes, I will certainly let those interested be aware by email. Make sure you’re signed up to my newsletter on my website. That’s where I normally send out any news. Very good article Pilar. Do you offer a coarse on how to spot trending items? I’m glad you enjoyed the article. I’m currently working with students in my Amazon FBA Pilot course. I have yet to put together a course for trending items. If anything, I will let people know of upcoming courses via email. You can sign up to it via my website. How do i subscribe to your newsletter? Thanks! I live in Panama and need to make this work from the southern part of the hemisphere. Gracias!! You can go to my website at http://www.pilarnewman.com and sign up to receive my email tips from there. First off, I admire your success and drive to help others. Your article is much appreciated. With that being said, my question is: If you could give an average timeline on how long it takes to go from “the root to the fruit” so-to speak. What would be an average time frame for you from the moment you spot a trend, to manufacturing, to shipping and finally, actually seeing it online ready for sale to the masses? Hi Derek! Thank you for your comments. This question depends a lot on what kind of contacts you’ve built up thus far in your arsenal of re-selling/business rolodex (when was the last time you heard that word? :-)…the more relationship building you do with manufacturers and agents, the more you know what to expect from them when inquiring about a new product. For me, the time from start to finish is anywhere from 3.5 to 5 weeks. It’s a healthy time frame and allows me time to process my strategy. Hope that helps! I just heard your interview on the Niche Pursuits podcast. Your story is very inspiring and just what I needed to hear. I have been working with a supplier in China and am in the process of making some changes. Although i am not sure everything is perfect i believe that taking action is the most important thing i can do now. I hope to eventually escape my corporate grind and have the freedom to spend time with my family. I look forward to learning more from you in the future. “Imperfect action is far better than perfect inaction.” I totally agree with you on that. Stick with it and learn as you go. If you stay in the game long enough, you will get a feel for what items offer the best selling opportunities. Best wishes on your Amazon journey! Pilar, I’m curious has most of your sales just been on Amazon US, and did you have to setup a new Amazon account for UK, etc.!? I’m only selling on the Amazon US platform at the moment. I’ve considered selling on their other platforms and may be getting on that at some point next year. There’s still plenty of opportunity that I continue to take advantage of on the Amazon US marketplace now. Thanks.